Left to right: Frasers Property Australia general manager - southern region Anthony Maugeri, shadow minister for trade, investment and jobs Craig Ondarchie, Dana Australia managing director Peter Langworthy, Dandenong mayor councillor Heang Tak, local ward councillor Angela Long, and Dana Australia CFO Andrew Moore. 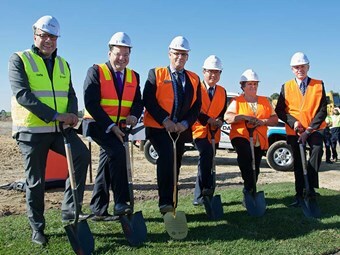 Powertrain manufacturer Dana Australia has turned the first sod on its new head office at the Key Industrial Park in Melbourne’s south-east. Scheduled to be completed by November, Dana Australia says the new 10,000sqm facility will have a 5-star Green Star rating and will combine all of its functions under one roof. Part of the $30 million Key Industrial Park, which comprises approximately 101 hectares of industrial land, the new offices form part of a local commitment according to Dana Australia managing director Peter Langworthy. "With this announcement, Dana is very pleased to confirm its ongoing commitment to manufacturing in Australia," Langworthy says. "As the world’s most trusted driveline manufacturer, we are reaffirming our ongoing support to our valued customer base, the Australian market and our staff. "Dana Australia remains resilient and focussed on the diversification plans implemented several years ago." While conceding the business is dealing with the fallout of a dwindling local car manufacturing market, Langworthy says the company will continue its investments. "Dana Australia has invested almost $1.5 million in new capital and equipment locally in the last 12 months and will invest a further $700,000 by the time the new building opens," he says. "We believe this project will deliver many benefits and greater efficiencies such as combining Design, Engineering and Manufacturing. "It will also allow for future growth." Attending the facility announcement was shadow minister for trade, investment and jobs Craig Ondarchie, Dandenong mayor councillor Heang Tak, local ward councillor Angela Long, and Dana staff.